This book tells the powerful 30-year love story of a young American woman and a delightfully eccentric gentleman and scholar. It is not often that I feel compelled to write a review of a book I have finished, but Marie touched my heart with the beautiful telling of her love story in Come Back Early Today: A Memoir of Love, Alzheimer’s and Joy. I thank her for sharing her sweet Ed with the world! There is so much to be learned and experienced through the pages of her book and thus, her life. I am a retired nurse. I taught Certified Nursing Assistants for many years and lost a dear aunt to Alzheimer’s disease. Marie’s descriptions and encouragement in the matters of this tragic disease are right on and so beneficial to caregivers of all realms. But, to say her book is about Alzheimer's disease would be missing the real depth of its purpose, I think. She made love tangible in her writing. She defined the true meaning of deep friendship. There are so many levels in my own life that Marie’s writing touched me. As a nurse and as a former teacher of young Certified Nursing Assistant students for assisted living care settings. As a niece watching my sweet aunt go away to that never land of lost memory and lost person. As a soul mate to my beloved husband. As a sister and daughter. As a friend. Maybe as a friend the very most. Marie’s honesty in telling how she was personally affected by the loss of her companionship with Ed humbled me. I love that she also protected Ed's dignity as much as possible. She told his story with the love and compassion of a dearly beloved partner. Marie and Ed were able to give one another such a rich fullness; Marie as a young adult and he in his golden years. Each of them gleaning and thriving in a love relationship that is truly quite rare, especially in today's society. The term “soul mate” is used by many to describe their feelings for one who is very dear to them, but Marie provided a definition for that term in her dynamic relationship with Ed. Her ability to change with him as his Alzheimer’s progressed, but to also continue to love and respect him so deeply, taught me what it truly means to be a soul mate. If I were a Hollywood director, I would be seeking permission to write a screenplay of Marie’s beautiful book. I know her Ed was not an angel, but he was an amazing, loving, and special man. We know so few in these times who are as deeply rooted in love, compassion and gentlemanship. Ed deserves to be remembered and honored, and Marie has done that in sharing his story and hers as they intertwined to make a lovely life despite Alzheimer’s. I think Come Back Early Today should be required reading for anyone who is working, or training to work, in the health care field. Social workers and the fast growing gerontology professions all need to have the insights she has given about the care of those who suffer from memory loss of all kinds. 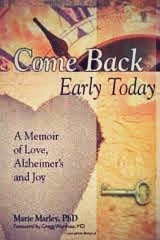 And most importantly, love partners of those with Alzheimer’s need to read this book. In the words of her endearing Ed, "Marvelous!" I am now a fan of Marie Marley, PhD!